In search of a brakepump for now. I fell in love with the car when I saw it during work. It is my first oldtimer. The previous owner is a big enthousiast of Volkswagen Beetle's and Porsches. 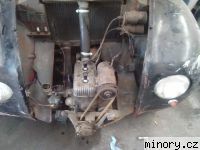 He kept the Minor for his own restoration project, he is now to old to finish. I am happy to take over the job and will do my best to get it back to it's former glory.